Weighed in this morning at 171 pounds, down another pound from yesterday. I did my walk-n-jog this morning. Yesterday, I stuck to the beef jerky diet, eating 8oz of jerky, 3 bottles of water, and two bottles of Fruit2O water. 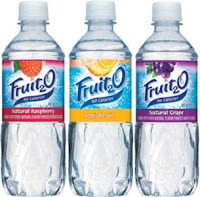 The "Fruit2O" is a fruit-flavored water, with no real fruit juice, no calories, no carbs, no nothing. Except however, it contains an artificial sweetener. My wife bought a case of it for me to try. There used to be a time when I wanted that sweet stuff. But now, after a couple of weeks of just drinking water, with a squirt of lemon juice, I don't like that sweetness, at least not in my water anyways. Fruit2O has a nice fruity taste, I wish they could just use the fruit flavoring without the sweeteners. Compared to plain bottled water with a squirt of lemon juice, the water seems to be more refreshing after eating a package of beef jerky. The Fruit2O feels like it has a thicker consistency, as if I'm gulping down sugar water. But I do appreciate knowing Fruit2O has some vitamins added. Of course, bottled water and a bottle of Real Lemon concentrate is far cheaper than Fruit2O.